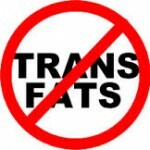 FDA Proposes new Trans Fat ban. Artificial, synthetic, industrial or manufactured trans fats are caused by the way some fats and oils are processed. They are found in foods that use hydrogenated or partially hydrogenated vegetable fats, such as deep-fried and baked foods. The primary dietary source for trans fats in processed food is “partially hydrogenated oils.” Look for them on the ingredient list on food packages. Trans fats raise your bad (LDL) cholesterol levels and lower your good (HDL) cholesterol levels. Eating trans fats increases your risk of developing heart disease and stroke. It’s also associated with a higher risk of developing type 2 diabetes.